I’ve always admired the way the Fresh Air Fund gives kids a chance to have a completely different summertime experience that can change their outlook on the world. I promised them I’d post their appeal for new family hosts for this summer. In 2009, The Fresh Air Fund‘s Volunteer Host Family program, called Friendly Town, gave close to 5,000 New York City boys and girls, ages six to 18, free summer experiences in the country and the suburbs. Volunteer host families shared their friendship and homes up to two weeks or more in 13 Northeastern states from Virginia to Maine and Canada. 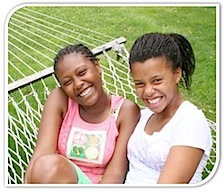 The Fresh Air Fund relies on donations to provide memorable summers to NYC children. The Fresh Air Fund needs hosts for the summer of 2010. More than 65% of all Fresh Air children are reinvited to stay with their host family, year after year. Thanks to host families who open up their homes for a few weeks each summer, children growing up in New York City’s toughest neighborhoods have experienced the joys of Fresh Air experiences. “It is rewarding to see the smile on our Fresh Air child’s face as she enjoys the simple things we take for granted…” Friendly Town host families are volunteers who live in the suburbs or small town communities. Host families range in size, ethnicity and background, but share the desire to open their hearts and homes to give city children an experience they will never forget. Hosts say the Fresh Air Experience is as enriching for their own families, as it is for the inner-city children. There are no financial requirements for hosting a child. Volunteers may request the age-group and gender of the Fresh Air youngster they would like to host. Stories about real Fresh Air host families and their New York City visitors are just available. Click here to learn more about becoming a host or call (800) 367-0003.